Literary Nonfiction. Art. Design. Information Science. Edited by Ariane Roth and Marina Schutz. Translated from the German by Alta L. Price. THE DYNAMIC LIBRARY presents essays in translation from an interdisciplinary symposium on the classification and organization of knowledge held at Sitterwerk, St.Gallen, in 2011. 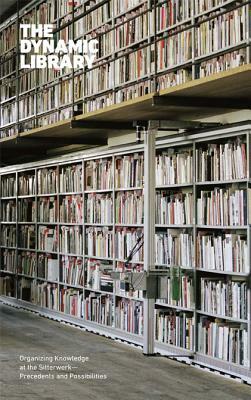 Home to over 25,000 volumes on art, architecture, design, and photography, the Sitterwerk's Kunstbibliothek (Art Library) began with the bequest of book collector and connoisseur Daniel Rohner (1948- 2007). The question of how to systematically organize this idiosyncratic collection into a publicly accessible library was a fundamental concern, and a solution was found in a dynamic system of organization powered by RFID technology, which relies on digital tracking. The essays gathered in THE DYNAMIC LIBRARY contextualize the Sitterwerk's associative classification system amid artistic and historical systems of order, while pointing to future methods for incorporating subjectivity and serendipity into the organization of knowledge. Contributors: Anthon Astrom, Dorothee Bauerle-Willert, Susanne Bieri, Christian Kern, Felix Lehner, Claudia Mareis, Gerhard Matter, Philipp Messner, Paul Michel, Hans Petschar, Tobias Schelling, Marina Schutz, Fabian Wegmuller, Hans Witschi, and Lukas Zimmer.